Ian Hislop and Nick Newman’s Trial by Laughter is a traditional play set in 1817 and portraying the story of William Hone, the unsung hero of free speech. Hone was a bookseller, publisher, and satirist, accused of parodying and posing threat to religious texts. In 1817, he stood trial for ‘impious blasphemy and seditious libel’. The only crime he had committed was his sense of humour. The actual subject matter and plot is interesting and tense, a story of scandal and satire. However, the delivery does not portray this story with the level of interest that is anticipated and desired. The beautiful Lowry stage and technical benefits of the theatre could definitely have been better utilised. The brief moments that they were used effectively, such as in scene changes when the clock would light up and the hands moved anti-clockwise to signify time passing, it was awe-inducing. This dramatic scene change was well received and would have been great if other scenes could have been illuminated and brought to life with the use of similar creative ideas. The artistic devices such as how the audience were addressed as the jury, seemed interactive and progressive, but didn’t fit with the formal and structured delivery of the play. Although it had pace, this pace consisted of Hone (played by Joseph Prowen), as Hone, racing through an extremely wordy monologue. Undoubtedly, there were some great moments of good old-fashioned comedy. The most humorous moments were certainly in the sub-text, as class and gender politics notably simmered under the surface, only to be revealed in jest. Overall, this play was enjoyable and clearly targeted at an experienced audience of seasoned theatre-goers as opposed to a modern family friendly play or one exploring contemporary issues. 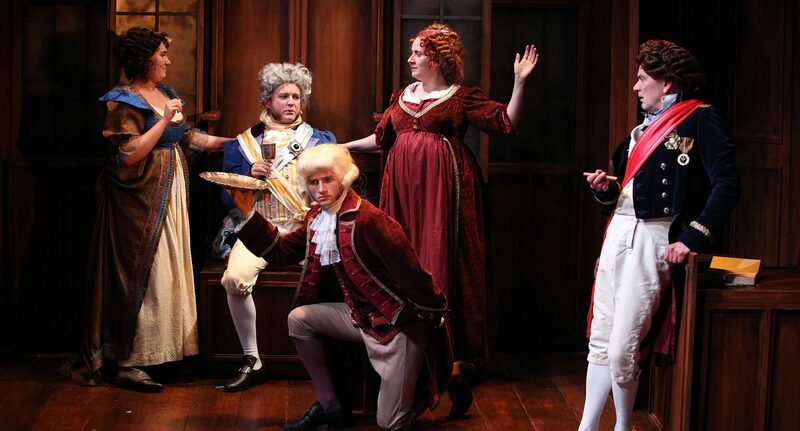 It is clear that Trial by Laughter is a play that will remain popular, for many reasons such as its comedy, portrayal of traditional English ideals, masculinity, chivalry, but it will not become popular amongst the masses.